On December 28th, 2017, Toronto broke a 57-year-old record as the temperature plummeted to a frigid -22 C. For many, this bone-chilling day was spent indoors, where it was easy to stay warm and cozy. However, for Toronto’s homeless, this day – like many other days this winter – was spent outside. While the city scrambled to open emergency shelters, many on the streets struggled to simply stay warm. 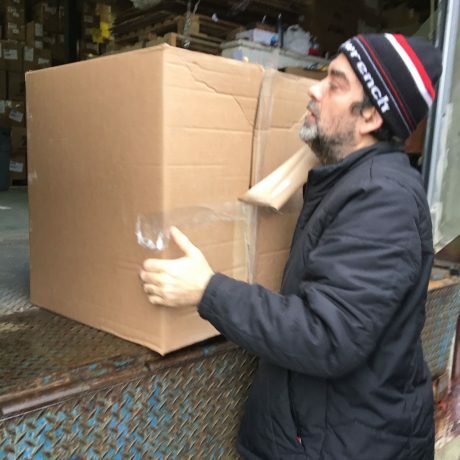 In an effort to alleviate some of the ongoing struggles faced by Toronto’s homeless, The Rhema Foundation Canada partnered with the Bargains Group to provide supplies for the local charity Engage and Change. Founded out of a desire to “foster good citizenship and encourage healthy communities by giving back,” Engage and Change works to support Toronto’s homeless population. The organization achieves this goal by giving people and companies opportunities to assist in poverty-alleviation projects — a mission that falls perfectly in line with the Foundation’s focus on Human Settlement. With an estimated 500 homeless people choosing to sleep outside in Toronto each night, the kits provide vital supplies for outdoor survival. The kits also act as communication tools that frontline workers can use to start conversations about shelter and support. Indeed, each kit can serve a much greater purpose than simply keeping someone warm on a cold night. To contribute to these life-saving kits, the Foundation turned to the Bargains Group – a discount wholesaler providing products for retail, non-profits, shelters, and trade shows. The Bargains Group has a long history of providing supplies for the homeless, making the organization the perfect supplier for sleeping bags, hygiene products, and other winter essentials. With these items in hand, the Foundation was able to put together several kits for Project Winter Survival. As this winter continues to prove, there is a desperate need to address the issue of homelessness in Toronto. While this conversation continues, the Foundation will continue to help frontline workers attend to the needs of the most vulnerable.